Movie TV Tech Geeks has created a very special easy to follow guide on enjoying a whole food healthy Halloween. Halloween can be tough for those of you watching your weight or dealing with diabetes so this will help you partake in all those mouth watering decadent treats without sending your blood sugar through the roof. You are going to learn how to make healthy Halloween treats for your children and any little ghouls and goblins that show up on your doorstep on October 31st. These foods will have you following the paleo guidelines. This means there will be no processed foods and no grains. But have no fear, the treats will still be both delicious and nutritious. But first, have you ever asked yourself how the tradition of eating Halloween candy got started? How did eating insane amounts of unhealthy, sugar-filled candy become a part of the Halloween festivities? Contrary to what your kids might learn from Charlie Brown, the Great Pumpkin is not going to come up out of the pumpkin patch to ensure that all the good little girls and boys have their fair share of candy. 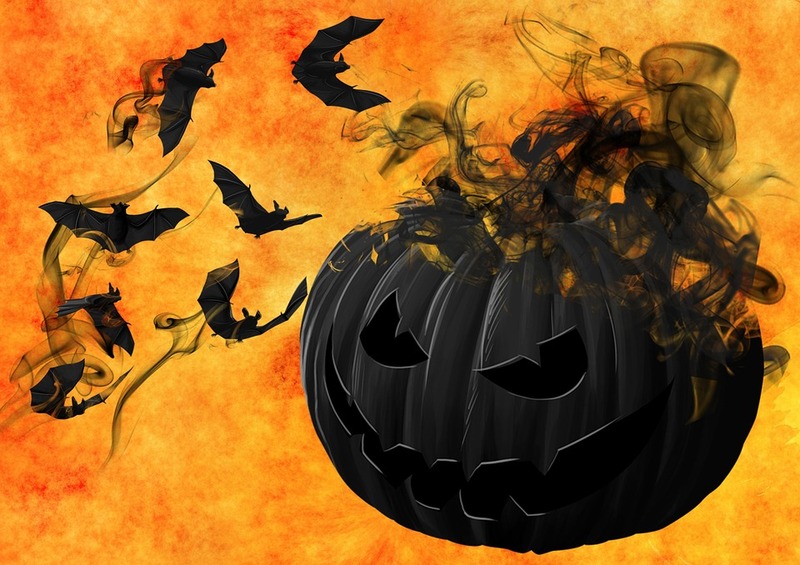 Even though the story of the Great Pumpkin has been around for more than 60 years, the true story of Halloween is actually much much older than that. 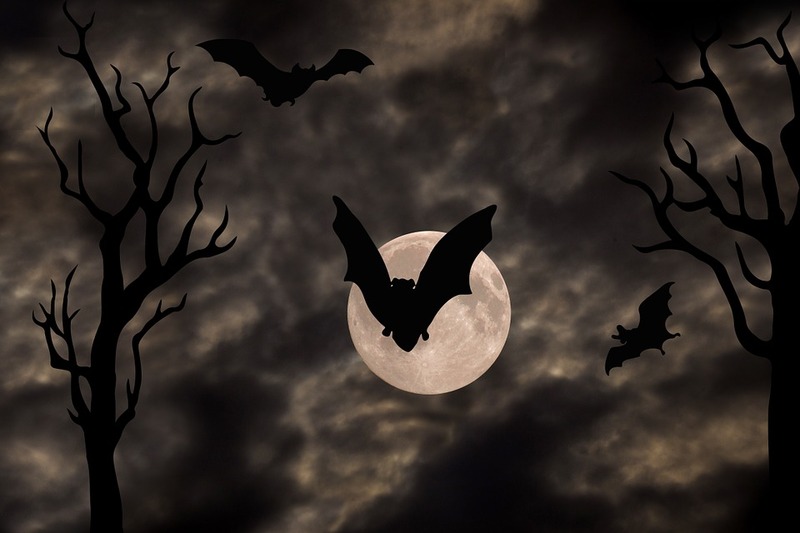 In order to learn where Halloween got started, you have to jump back in time about 2,000 years to the beginning of the Celtic Festival of Samhain, which is celebrated annually on November 1. On the previous night, October 31, our Halloween date, the Celts were quite certain that dead humans would make a presence as ghosts. The idea of encountering and possibly suffering from an interaction with ghosts and goblins was scary, to say the least. 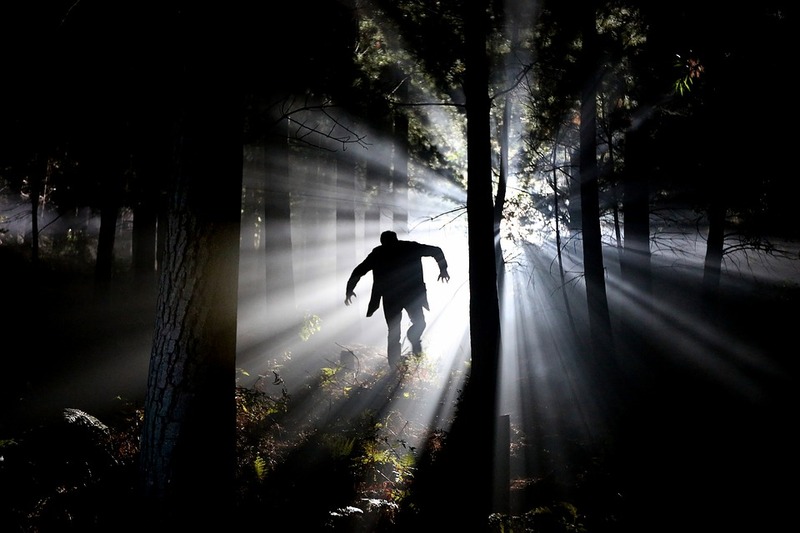 Because of this, practitioners of Samhain and its night-before ghostly beliefs would dress as ghosts if they had to leave their homes at night. The belief was that the “real” ghosts would simply think they were one of them, and pass them by. Food and drink were also placed on doorsteps, to keep the ghosts busy eating and drinking, instead of terrorizing people. 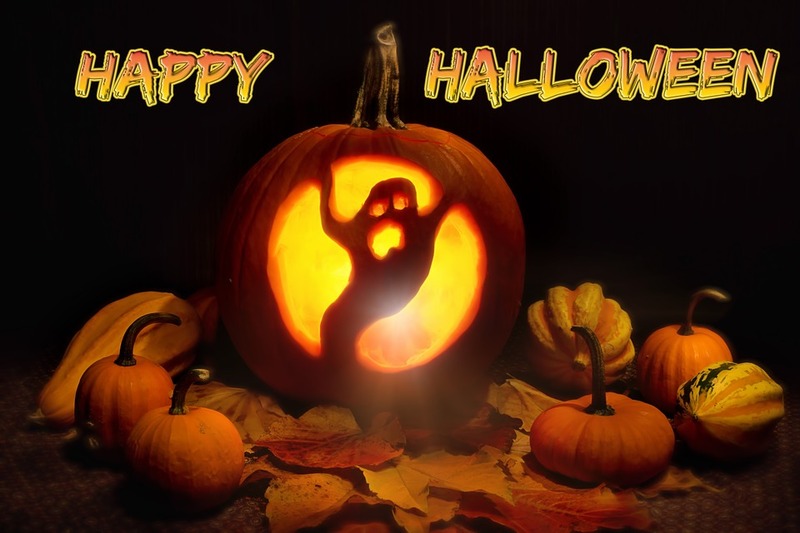 Sometime in the 8th century, Christian religions saw Samhain as a way to celebrate their Saints. Samhain became All Hallows and stayed on November 1, so the night before logically became All Hallows Eve. This quickly became shortened to Halloween. Today’s practice of trick-or-treating, dressing up as imaginary creatures, characters or monsters and accepting gifts of candy in return for leaving someone’s home, began in medieval Britain. The following recipes, tips and best practices for a healthy Halloween experience are based on proven paleo practices and whole food goodness. The term “whole food” is thought to have officially debuted to the public in 1982. That is when T. Colin Campbell and a dozen other researchers released the first United States document discussing the possible relationship between diet, cancer, and nutrition. Campbell believed vegans and vegetarians often ate foods that his research showed were linked to cancer and other chronic and debilitating diseases. He preferred to talk about “whole food” and “plant-based” food because the fresh fruits and vegetables were linked to so many health benefits. What Campbell didn’t know is that in searching for a term that avoided the words “vegetarian” and “vegan,” he would name a health movement that is still going strong decades later. These healthy foods do amazing things for our bodies, and these are the foods and ingredients we are going to use to make whole food Halloween candies for your little goblins. These fun and wild-looking little monster heads are super-nutritious. All you need are a couple of green apples, unprocessed sunflower butter or guacamole, sunflower seeds, strawberries, blackberries and a banana. The whitish appearance of the banana makes the black of the blackberry drupelet really stand out. 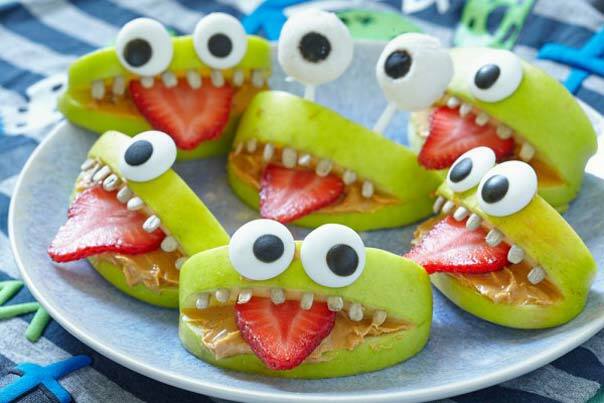 You may have to make a few of these before you get the process down, but once you do, you can see how fun, silly and monstrous-looking these healthy whole food Halloween treats are. These require only 2 ingredients and are super-simple, deliver a lot of vitamin C and other essential nutrients, meaning that even the youngest children can help make them. Stick the celery stem into your miniature “pumpkin”, and you are done! These will be a real treat with the kids. 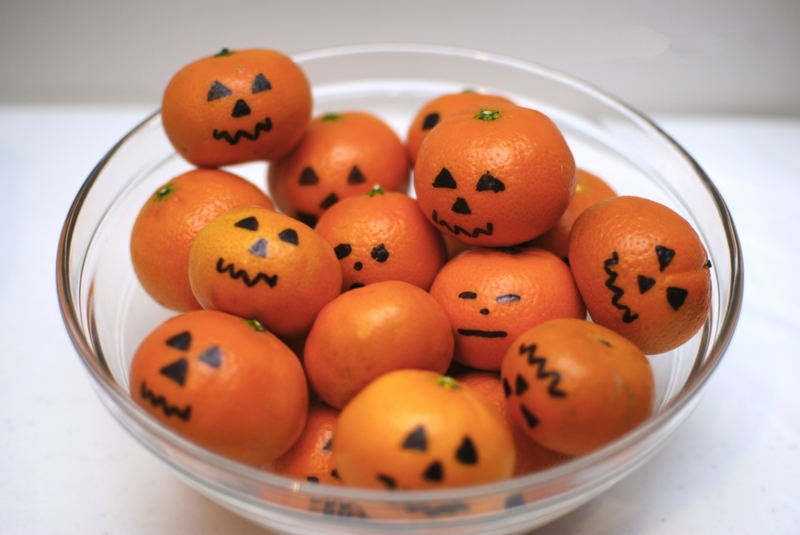 They are miniature, portable jack-o’-lanterns that you can fill with any type of healthy, nutritious treats. Fill with whatever healthy, natural, unprocessed berries, seeds and diced or chopped fruits you like. Carefully scoop out the meat of the orange. 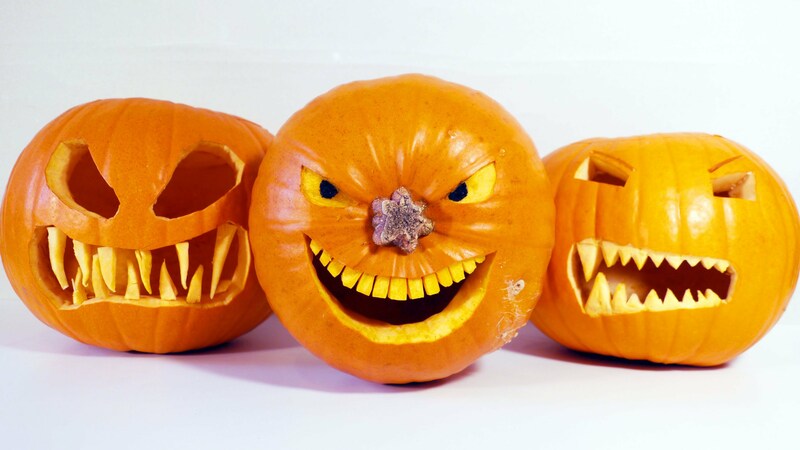 Cut out a jagged, diagonal pattern in the top of your baby jack-o’-lantern, and carve out the face, nose and mouth. If that description sounds a little scary, don’t worry. No real brains will be harmed in the making of this recipe! You’ll be using a spaghetti squash to create the brains which will “ooze” out of orange and red peppers which will make Frankenstein heads. Halloween is not just for kids. Adults every year attend parties where good food and drink combine with friendship and creative costumes to make for memorable and enjoyable experiences on October 31. 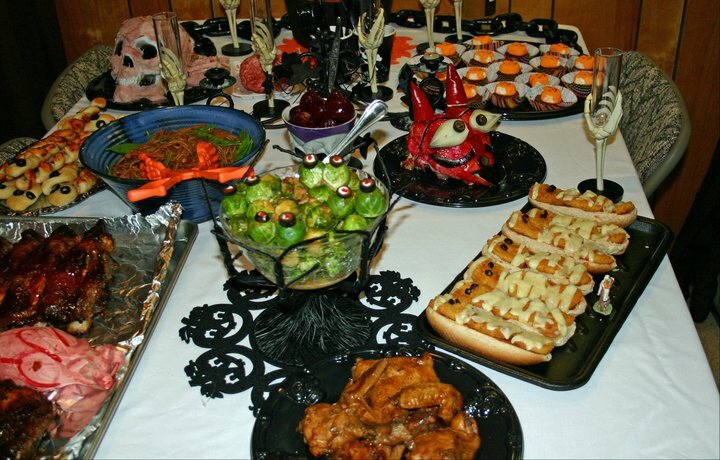 Both adults and children need a lot of energy for their Halloween activities, and you can provide this by whipping together the perfect Halloween-themed dinner. 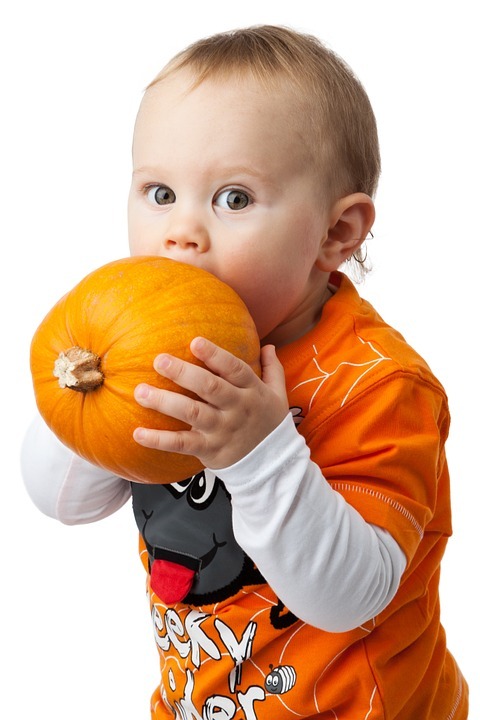 Below are a few ideas to get you thinking about your whole food Halloween dinner table so you and your family enjoy a nutritious and fun Halloween meal. As you probably know, the predominant color for Halloween is orange. This means you should think about adding the incredibly nutritious sweet potato to your Halloween dinner plans. The meat of a sweet potato or yam can be whipped into an orange paste or purée which can be used in a number of dishes. Bear in mind that yams and sweet potatoes are starchy and carb-rich, so enjoy them in moderation if you are trying to lose weight. 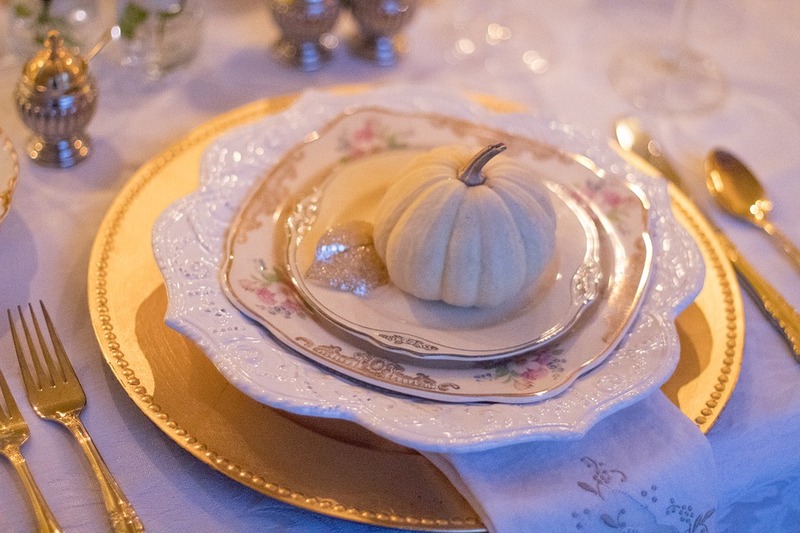 Another orange visual treat that sticks to the theme of Halloween uses miniature pumpkins as replacements for soup bowls. Whip together your favorite whole-foods soup recipe, and instead of pouring in traditional bowls, use small, scooped-out pumpkins as the containers. Juicing carrots, oranges, cucumbers and apples gives you an incredibly nutritious beverage to drink with your dinner, one that keeps with the orange colored Halloween motif. Take the mini pumpkin soup bowl to a bigger extreme. 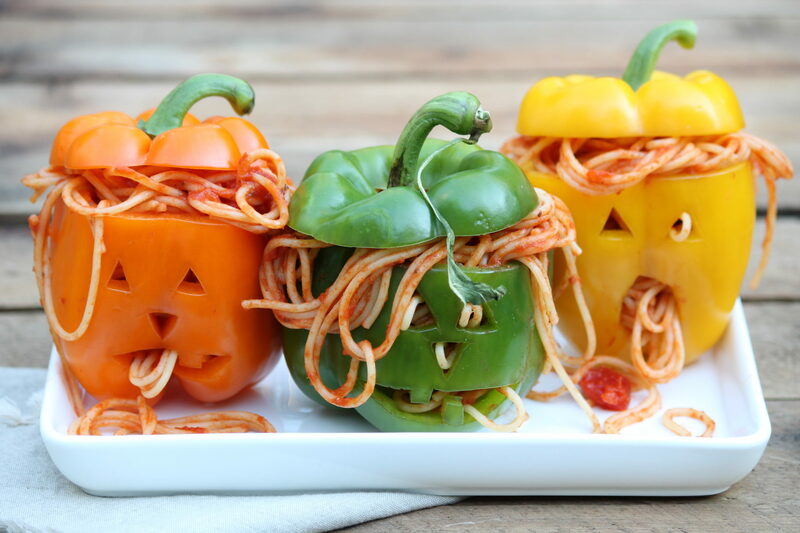 This is a simple way to add the iconic pumpkin to this year’s Halloween mealtime. Find a large pumpkin, remove the top, flesh and seeds, and carve out a jack-o’-lantern just like you would if you were going to add a candle and decorate your home traditionally. This time though, you are going to use this pumpkin as not only your dinner table centerpiece, but also as a salad bowl. Line the interior walls of the pumpkin with large lettuce leaves. Then fill with your family’s favorite salad items. This jack-o’-lantern salad bowl is extremely versatile, because after dinner, you can drop a candle inside and place Jack on your front porch to do double duty this Halloween. This serving bowl replacement also makes a good home for your favorite whole foods casserole. Just transfer from your casserole dish or slow cooker. Papaya, carrots, pumpkin and orange tomatoes are a few more healthy orange whole foods you can include in your Halloween dinner recipes. The previously mentioned sweet potatoes join cantaloupe, apricots, golden beets and guava as foods with orange colors and hues that not only keep you on theme for Halloween, but also deliver essential nutrients and vitamins, and boost your immune system health. Zoodles are noodle alternatives created using zucchinis. Using a spiralizer and a few thin, long zucchinis, whip out some “noodles”. Over medium-high heat, sauté your zoodles in coconut oil or extra-virgin olive oil for about 3 to 5 minutes. Serve in any container and drizzle with cranberry juice for a bloody-brains Halloween dish. 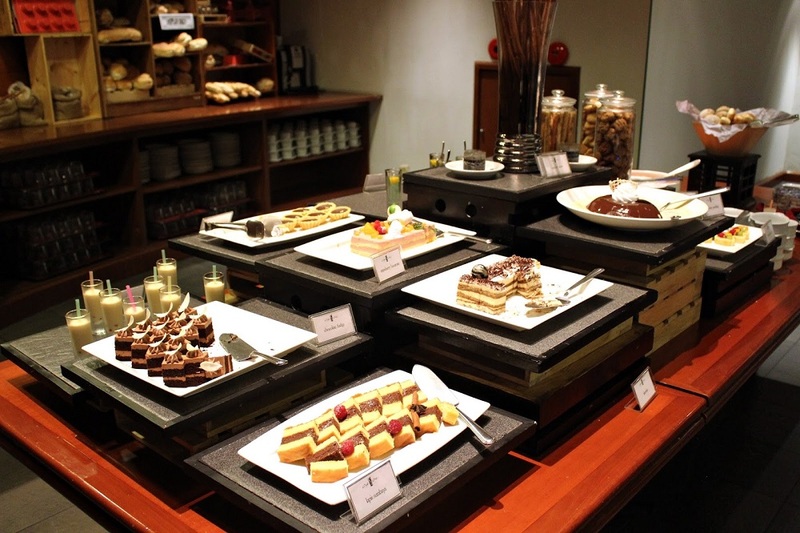 What Halloween dinner would be complete without dessert? 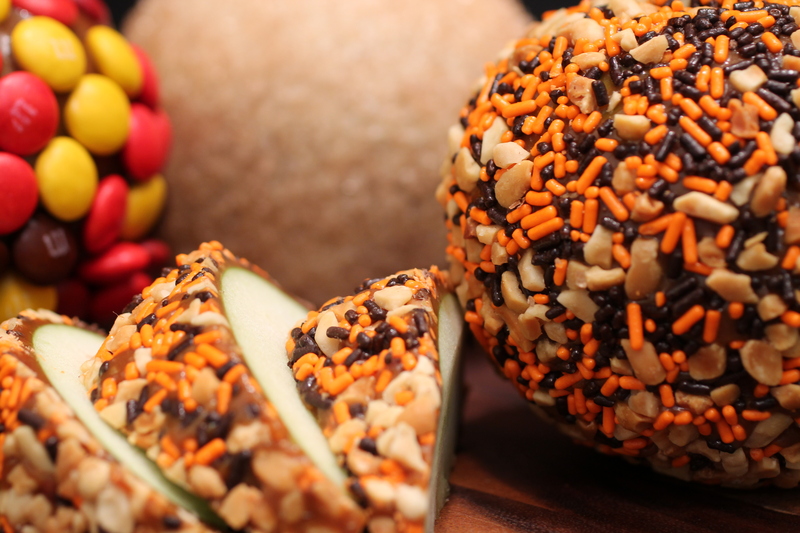 The following recipe replaces the traditional candied apples common to Halloween festivities with a healthy and nutritious whole food alternative. 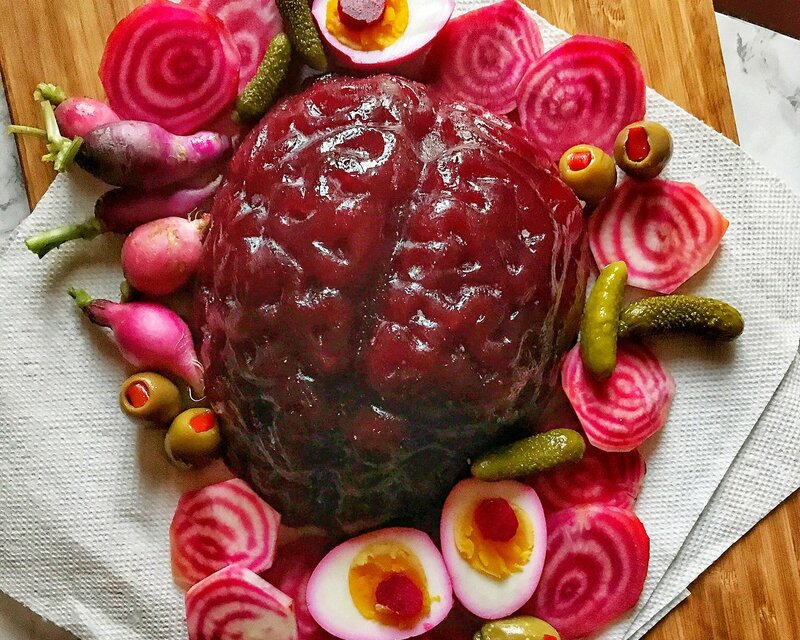 The candied apples, zoodle brains, pumpkin bowls and brain-oozing Frankenstein head recipes just covered will all be a hit at your upcoming Halloween whole food party. The same will definitely be true for your scary mini jack-o’-lanterns, juicy baby pumpkins and green apple monsters. Any one of these recipes is sure to be a hit at your Halloween festivities. 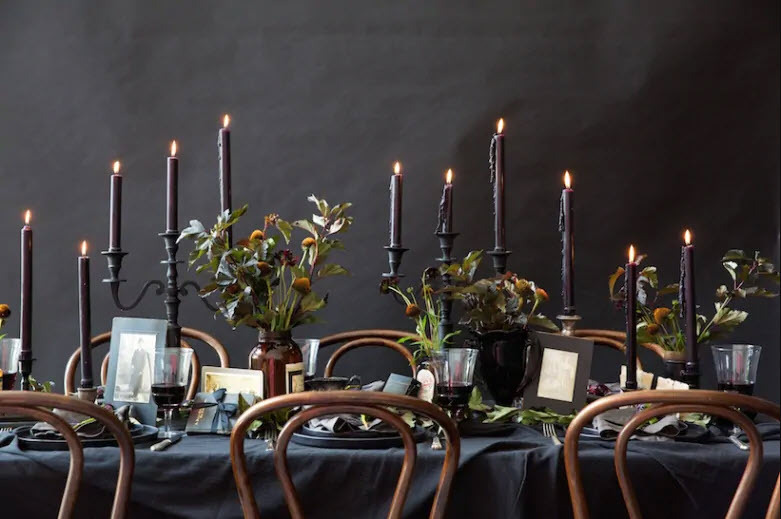 Here are a few more tips for planning your Whole Food Halloween party so it goes off without a hitch, and makes both whole foodies and junk food eaters happy. Don’t forget to include some non-whole foods. You probably understand that all your friends and your children’s friends are not going to be 100% dedicated to the whole food dietary approach. This means you should include some traditional Halloween treats and snacks. Make sure bobbing for apples is included. This is a holiday game seen around Halloween and Christmas that has a whole food, the apple, as its focus. It is also fun for all ages. Batch cook. 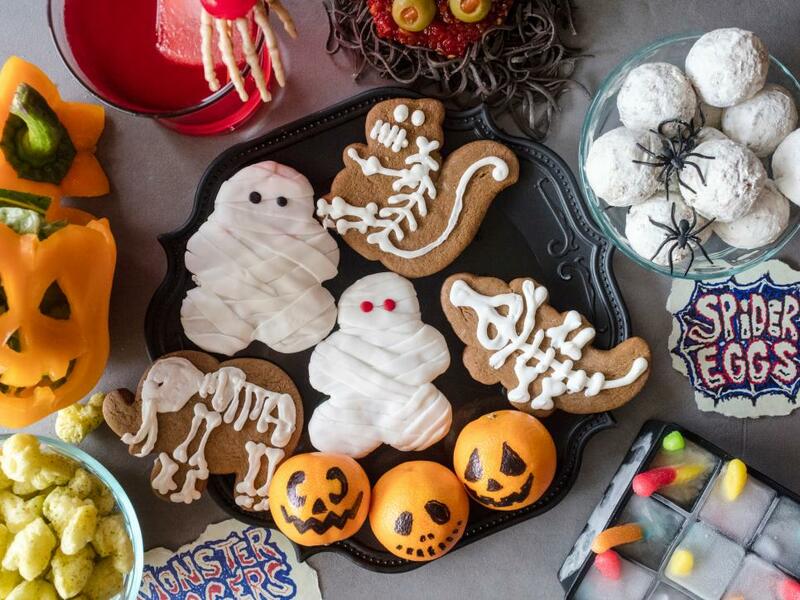 Make large batches of the whole foods Halloween recipes in this report ahead of time. Freeze or refrigerate them accordingly. Pull out in time to warm up or serve. Have a puréed whole food identification contest. There are multiple fruits which can be mashed, puréed or blended into a paste-like consistency. Hosting a blindfolded “what is this whole food” contest may just convince your friends and other party-goers that whole foods are as delicious as they are nutritious. Have a designated table where people can blend their own whole food smoothies. This means you are going to have to have a lot of ice on hand, as well as a wide variety of vegetables and frozen fruits so people can experiment with different healthy whole food smoothie recipes. Get help from your other whole food friends. It’s no fun to have to do everything. If you love whole foods, you probably have some friends that do as well. Get them involved, helping you cook and decorate. Don’t forget to have fun. Nobody likes a whole food bully or paleo policeman. If someone doesn’t want to try your favorite whole foods dish that you worked all day on, that is their loss. Remember that Halloween is for being with the ones you love, not for trying to force your dietary beliefs on someone else. Before Halloween is even in sight your kids are already talking about the costumes they want to wear. A lot of parents get their children involved in creating their own Halloween costumes, which boosts creativity and independence. You can further advance both of those admirable traits in your children when you let them (help them?) 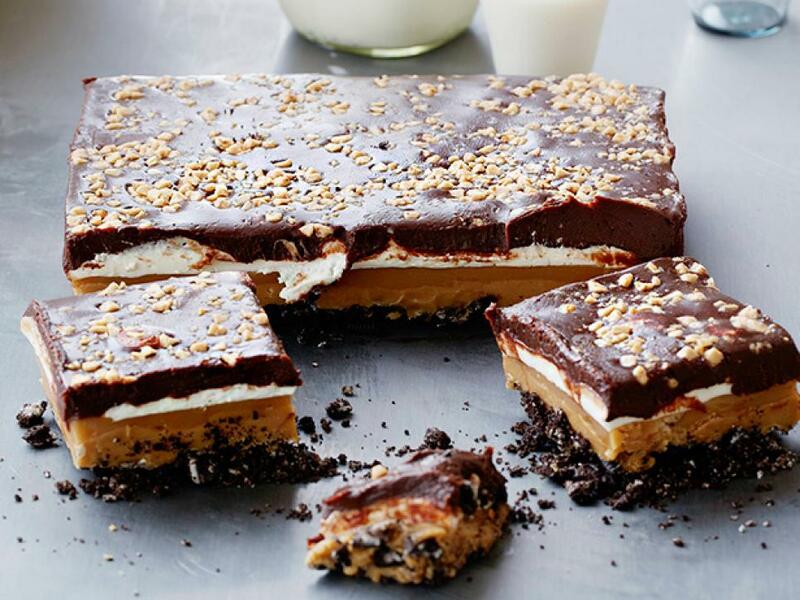 make the following Halloween whole food recipes. 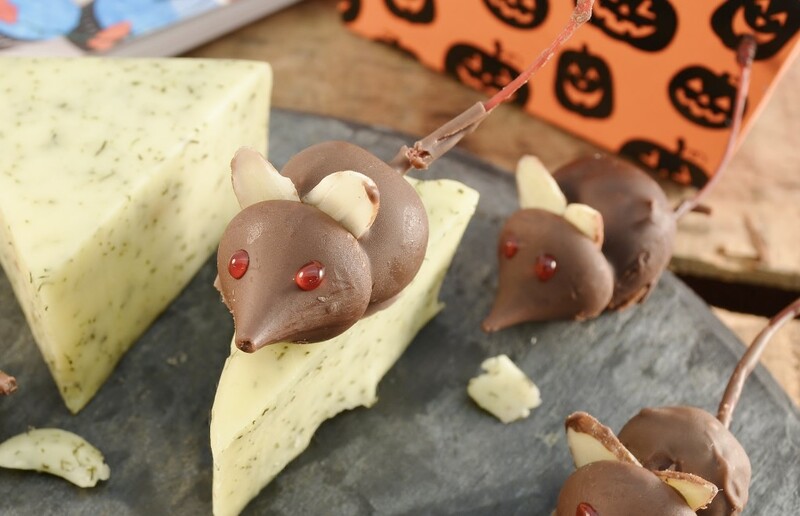 One of the simplest and most fun Halloween recipes your child can whip together has just 3 ingredients. Get your hands on some fresh bananas. Next you will want some small black olives, preferably sliced, or you can slice them yourself. You will need some blackberries as well. Refrigerate the bananas for 30 minutes. What you are trying to do is make them firmer so that when you slice them they don’t turn into mush in your hands. The fresher your bananas are, the better. After they have been properly chilled, peel the bananas and slice them down the middle lengthwise. Then cut them in half. This will leave you with 4 pieces from each banana. On some parchment paper or tinfoil, lay the banana pieces flat side down. Take a thin slice of the black olives and gently push it into the banana about 1 ½ or 2 inches from the top. This will form the round O-shaped mouth of your ghost. 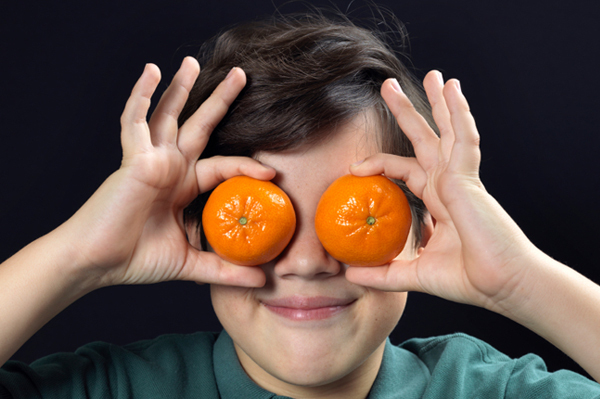 Above the mouth, carve or scoop out two small, round cavities for the ghost’s eyes. Mash a few blackberries into a paste, adding puréed dates for sweetness if you like. Place this paste into the eye holes of your ghost, and you are done. If your children are very young, you can slice the bananas for them. 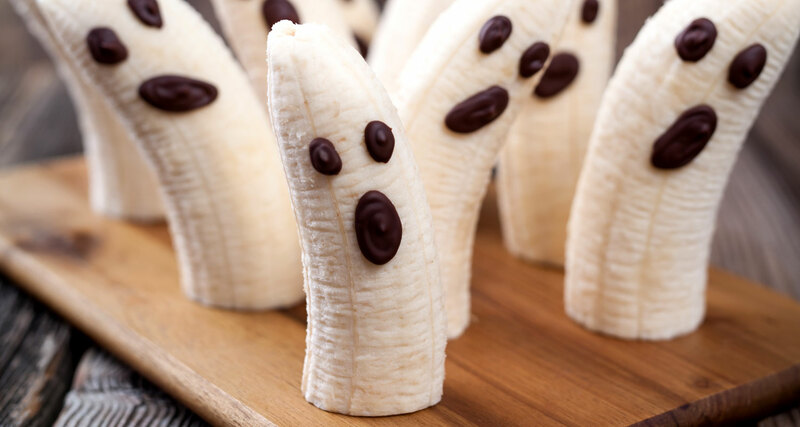 Other than that, every step of this ghostly recipe is child-friendly. This recipe should only be handled by children you trust with an apple and fruit peeler. 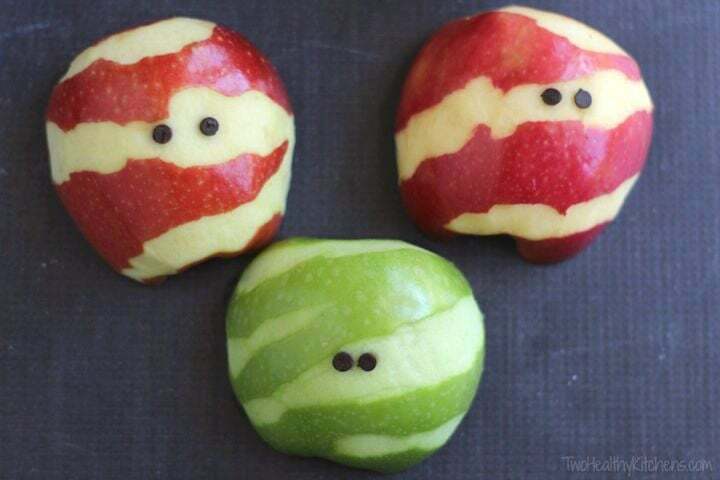 Your child can re-create a mummy’s cloth wrappings by peeling the skin of an apple. Instead of attempting to remove all the skin, peel it so that there are strips of skin surrounding the Apple. This mimics a mummy’s cloth! Carve out and fill two small holes with blackberry paste or bits of black olives for eyes. Have your child measure out 1/3 cup raw walnuts, 1/3 cup raw almonds and 1/3 cup raw cashews. 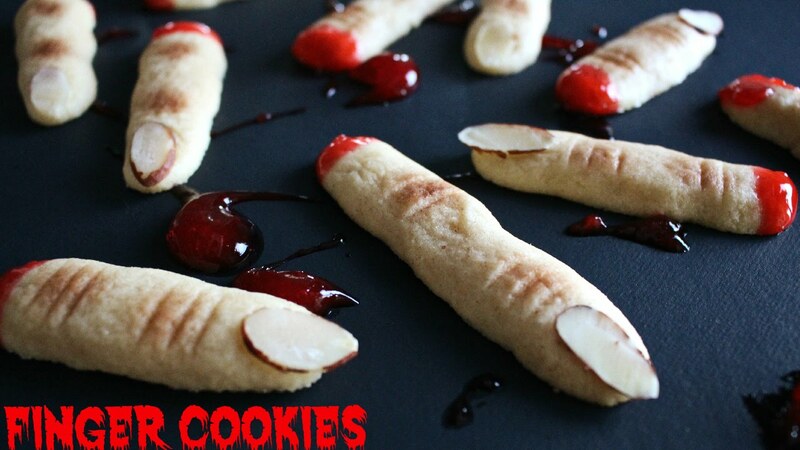 Form this dough mixture into 3-inch long finger shapes, adding almond slices for fingernails. Chill for 15 to 20 minutes and enjoy. 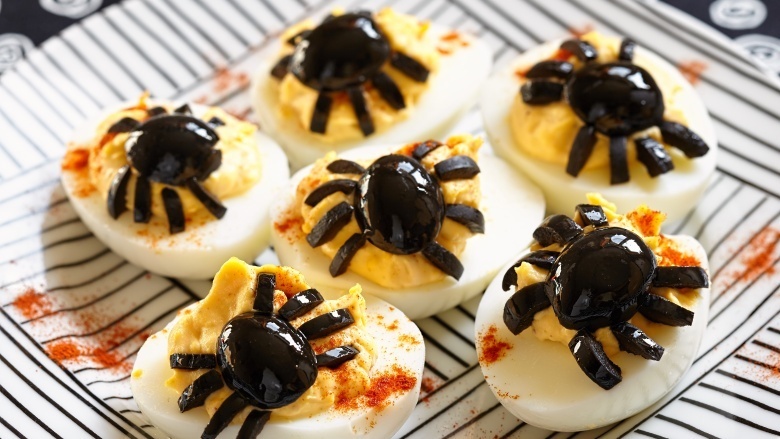 Getting into the holiday spirit means spicing up your children’s lunches with Halloween themed foods and treats. Here are a few whole food, paleo-friendly recipes that are as healthy as they are Halloweenish. This is a Halloween adaptation of the peanut butter and raisin ants on a log recipe. Fill celery sticks with any healthy, unprocessed nut butter. You may alternately use unprocessed guacamole. 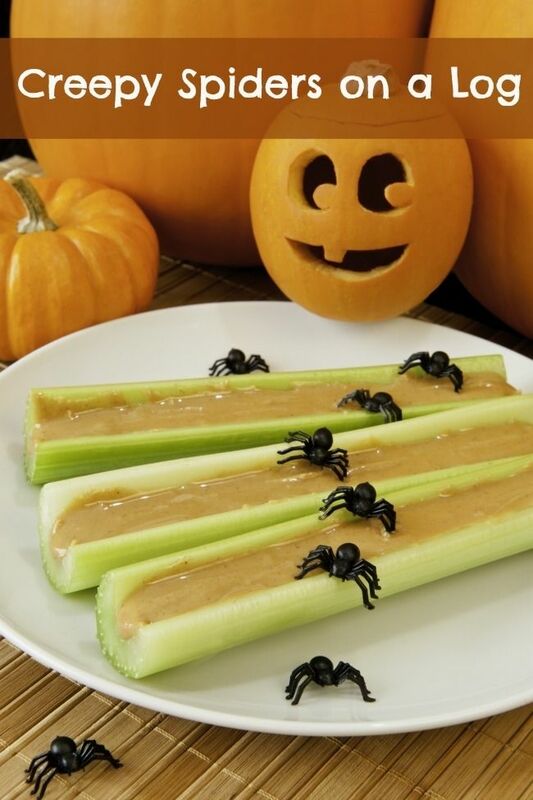 Your favorite nuts or large seeds make up the body of your spiders, which you place along the length of your celery “logs”. Finely chop thin, short lengths of black olives to serve as the legs of your spiders. Take a half-dozen hard-boiled eggs and split them down the middle. Remove the yoke and mix with a little coconut oil or extra-virgin olive oil to form a paste. Fill the holes in the egg cavities with this paste. Slice 6 black olives down the middle. In each one of your 12 half-eggs, place one half of a black olive, rounded side up, pushing gently down into the egg paste. Cut some more black olives down the middle vertically, and then slice them. These pieces will serve as the eggs of your spiders. Push them into the egg paste, as if they are legs coming off the body of the spider and hanging over the side of the egg. Rambutans are small round fruits that are red with green and hairy exterior tentacles when they are ripe. These eerie-looking fruits are perfect for Halloween, and in literally just a couple of minutes, you can use them to create spooky Halloween eyeballs that are nutritious, delicious and hard to look away from. First, slice a few rambutans in half. Inside the red exterior of the fruit you will find a grape-shaped oval that will either be white, yellow or translucent. There is a seed in the center of this grape-like meat that is not edible. Remove it. Eat the fruit, or use it to make a purée or paste in conjunction with an avocado or your favorite nuts and berries. 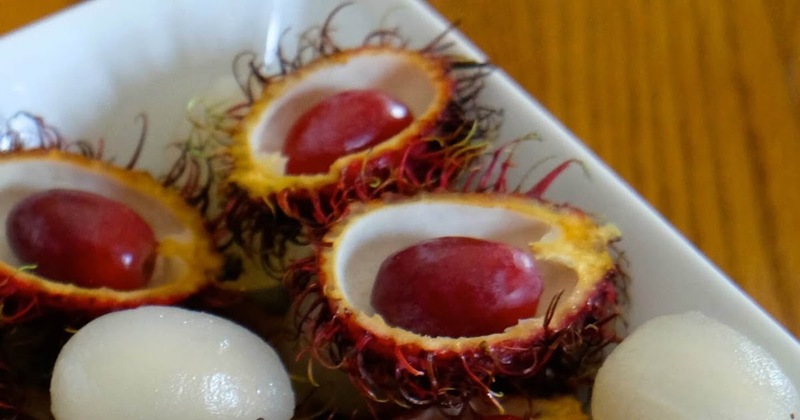 In a small serving tray, place the hairy, attention-grabbing Rambutan skins curved side down. Drop black olives or your favorite grapes into the rambutan cavities, and you have spooky and healthy Halloween eyeballs. The term “pot luck” generally refers to meals or parties where individual guests each contribute a dish. This provides for both surprise and variety, and arranging a Halloween pot luck get-together can mean some spooky treats as well. Here are a few whole food Halloween pot luck recipes and ideas that are paleo-friendly, delicious and nutritious. Making this mummified meatloaf is simple, but it is sure to impress. It treats both your taste buds and your love of Halloween at the same time. Form 2 pounds of your favorite paleo-friendly ground beef into the shape of a human head in a baking dish, leaving it flat on its bottom side. Season your beef with whatever natural herbs and spices you desire. Cut and carve white onion pieces into shapes which will make up your mummy’s eyes and teeth. Add the eyes and teeth to your beef mixture. 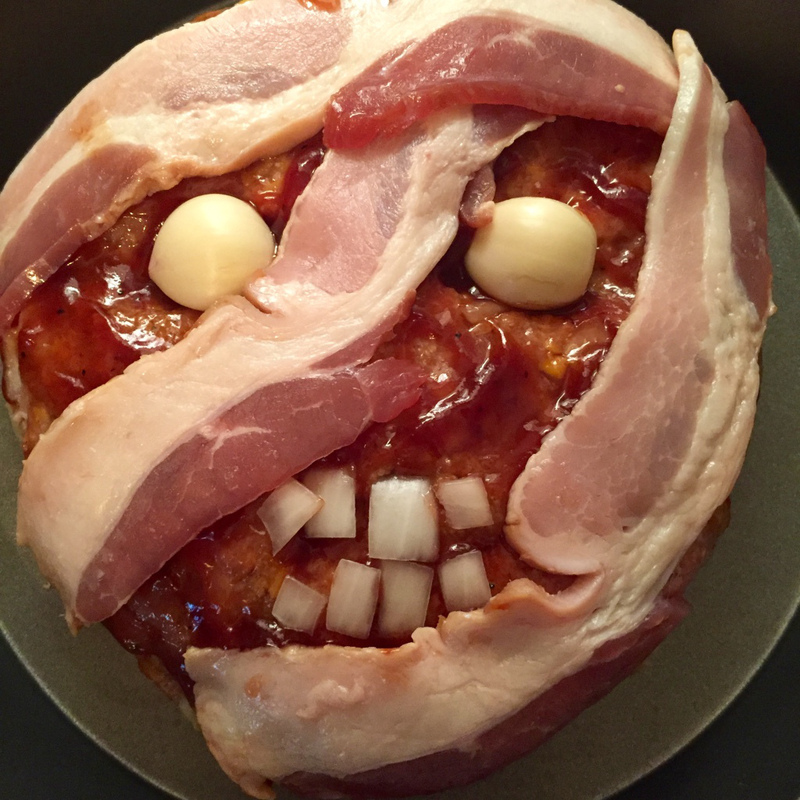 Wrap strips of bacon across the top of your mummy head, tucking the ends underneath. You want your bacon to mimic the cloth wrappings seen on traditional mummies. Cook in a preheated 350°F oven for 45 to 60 minutes. The creation is frightful and disturbing as much as it is delicious and full of protein. 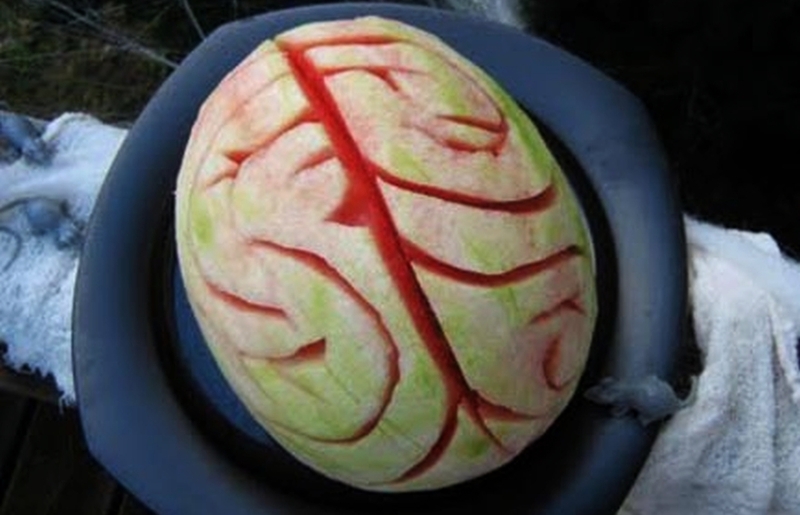 If you have time and patience, you can transform a simple watermelon into a human brain. Get your hands on a small seedless watermelon, a vegetable peeler, a paring knife and a larger chef’s knife. Slice a little bit off of the bottom side of your watermelon so that it sits flat. Peel off just the exterior green rind. With your paring knife, carve folds and channels in the white, fleshy rind of the watermelon. Pull up a picture of a human brain on your smart phone or tablet to get an idea of the visual you are trying to create. Next you are going to carve deeper channels into the melon so you can see its red interior. That’s it. You are done. Done properly, and it may take some practice, this simple process turns a watermelon into an unforgettable Halloween health food that will make you the talk of your pot luck dinner. Whip together your favorite paleo punch, with plenty of healthy, unprocessed fruit and veggie juices. 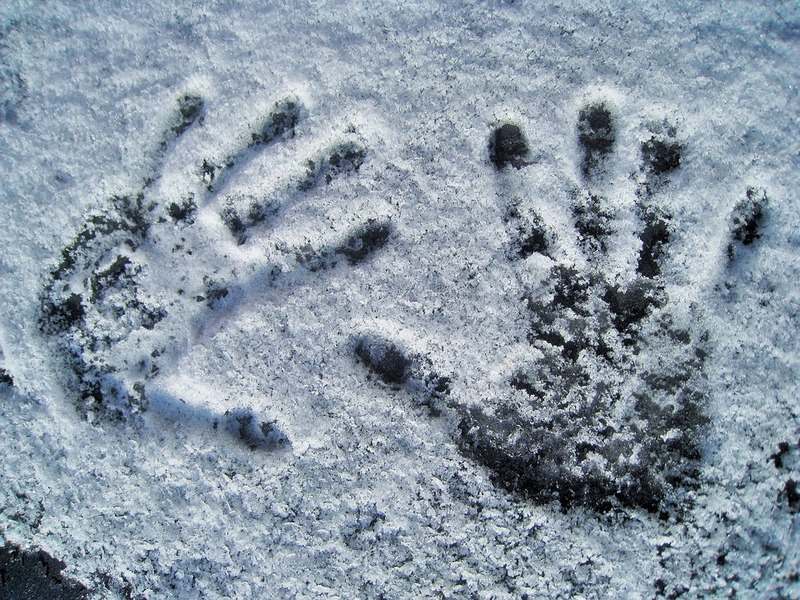 Add this floating frozen hand. You can alternately place this frozen hand in any large, dense dish, as if a human hand is reaching out from below. 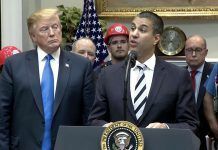 You will need an inexpensive, thin dishwashing glove. Turn it inside out and wash and rinse thoroughly. Fill it with filtered water, securely tying off the wrist. Place this hand in your freezer and let science take care of the rest. This frozen hand looks great floating in a punch bowl, and can also be drizzled with a mixture of cranberry juice and raw honey or maple syrup to make a bloodied hand you can use in any number of Halloween pot luck dishes. Whole food eating doesn’t have to be bland. 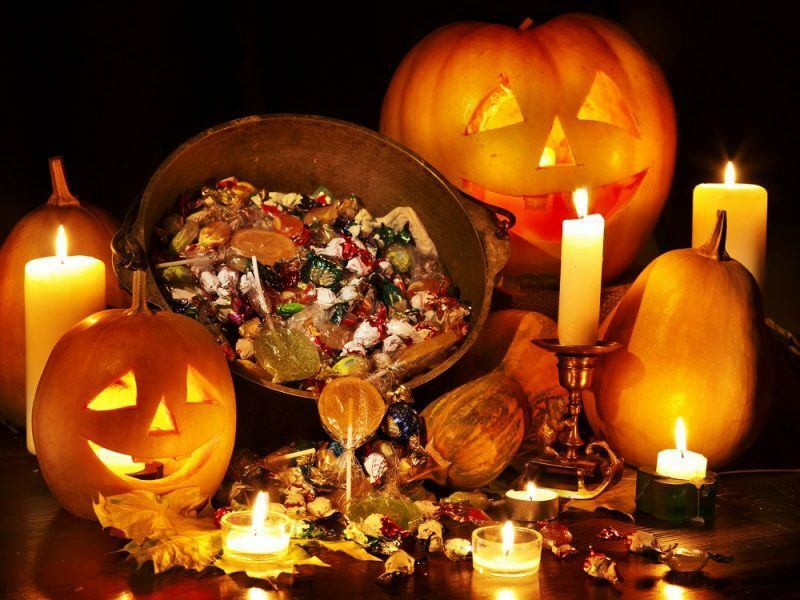 Just like Christmas will still see your children will dreaming of sugarplum fairies dancing in their heads, Halloween will likely still have them dreaming of sinking their teeth into an unhealthy handful of candied corn or a candy bar. However, if you take some time to experiment with the best practices and recipes mentioned above, you don’t have to trade health for your child’s happiness on Halloween. Experimentation is the key. The above recipes have not been tested and created in your kitchen! That means that as soon as possible, when you have the time in your busy life, you should get started now so you will know how to tweak and fine-tune these yummy treats to your specific cooking experience. You can also replace the above ingredients with any healthy, whole foods as you see fit, where they make sense. Don’t forget to get the kids involved. Establishing healthy whole food eating practices in your kids has a better chance for success when you get them started early. Kids love to help out in the kitchen, so be sure to involve your little witches, princesses and vampires in embracing a healthy and nutritious Halloween celebration.